Sitting is the new smoking…no matter how you look at it, it’s bad for your health. Most employees’ sit for long periods of time at a desk, commuting (sitting) or sitting in airports and on planes. When you factor stressful days into the high inactivity levels, many people experience, the population begins to experience both physical and mental tolls on their bodies. Research shows that exercise is proven to relieve the stress of physical inactivity and also improve people’s moods and function. The following list has some simple, powerful changes you can make throughout the day to boost your mood and metabolism while creating new healthier lifestyle habits. Take a deep breath, relax, and read on! 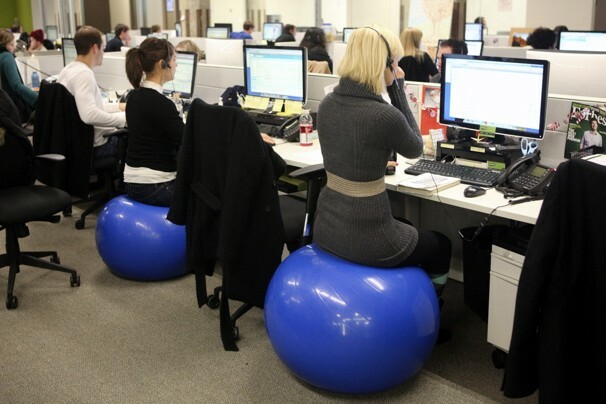 The following tips are inexpensive ways that employees may reduce the risks of sitting all day. Don’t be a 21st-century casualty of sitting. Make time for a 10-15-minute walk outside! Schedule the time, every 2 hours on your calendar and set a reminder on your device and computer. Use your break time to unplug and disconnect from technology and reconnect to your mind. These breaks may lead to breakthroughs and better performance. Stability balls are filled with air and come in sizes 45cm, 55cm, and 65cm, depending on your height. Sitting an hour a day on a stability ball can help improve balance and improve the strength and integrity of your abdominal muscles. These muscles become engaged from sitting on the ball, to keep the ball from rolling away underneath you. Sitting on this type of “seat” also forces your postural muscles to work rather than slouch. Stability balls may help relieve back pain. Hunching strains areas including your shoulders, lower back, neck, and wrists. Be aware of where your body is in space and continuously use small movement exercises to bring your shoulders down and back. Set your computer at the right height allowing you to relieve pressure on your neck from looking down all day. First off, take lunch and use this time as an opportunity to move and socialize. Instead of eating lunch at your desk, now that the weather is nice, be creative find a spot outside, walk to a nearby local lunch spot, or grab a friend, eat in the lunch room, and then walk around the neighborhood the other 35 minutes. A more advanced option is to take an exercise class during lunch and eat at your desk later. You’ve heard this before, so we’ll say it again! If given the option between stairs and an elevator, take the stairs. You could even take the ½ and ½ route, elevator ½ way up and walk the rest of the way. Another option, walking meetings around the corridor or a few laps around the building. If you have a smartphone, put it to good use and schedule movement breaks. For every 90-120 minutes of sitting, use your alarm to remind you it’s time for your 10-15 minute break (from step 1) This should encourage you to take at least 3 movement breaks a day, one in the morning, one early afternoon, and one late afternoon. The bottom line is that sitting is the new smoking and employees need to counteract the effects prolonged sitting has to their health each day. British Psychological Society (BPS). “Office workers spend too much time at their desks, experts say.” Science Daily. Science Daily, 15 January 2012.